What is the “genius of a place”—and how do you protect it, especially in the face of intrusive tourism and the less-appealing side of modernization? That’s the big question that Sarah Marder and the other crew members behind “The Genius of a Place,” a documentary film set in Cortona, Italy, have been trying to figure out. Like many other towns throughout Tuscany and the rest of Italy, Cortona spent centuries as a sleepy, beautiful, seemingly-medieval enclave. And then a book came out: Under the Tuscan Sun… followed by the movie with Diane Lane. Tourists, enthralled (with reason!) by the images of this hidden gem, started pouring in. 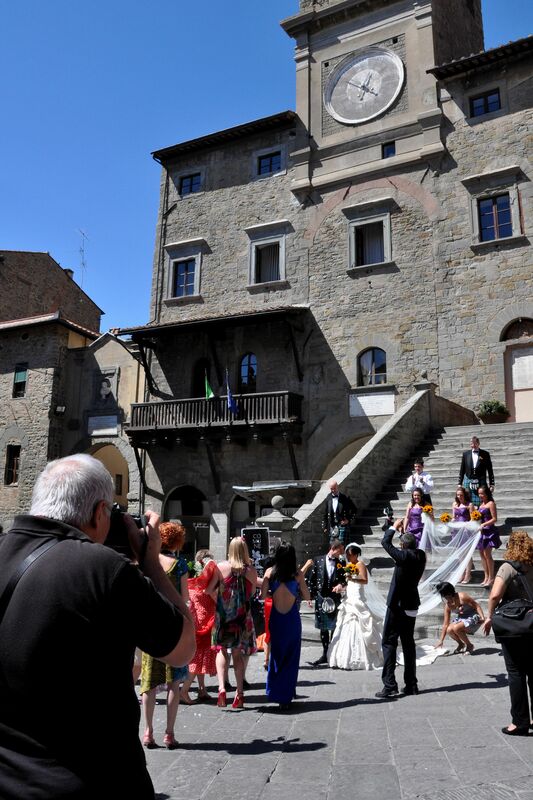 Today, only about 1,500 people live in Cortona’s historic center. But some 450,000 tourists visit that same center every year. As you can imagine, so much tourism has affected the town. In an interview we had with Marder (for the full interview, listen to the audio at the bottom of this post), she listed a few: Souvenir shops replacing shops locals can go to to buy necessities like groceries, or hammers, or socks. Expensive restaurants and eateries instead of cheap trattorias. Rising real estate prices, encouraging locals to sell their shops and homes and move to the outskirts. During high season, excessive water usage. Difficulty parking. Overflowing dumpsters. And the main streets in this town—which was once known as a “City of Silence”—full of crowds and noise. Cortona hasn’t been “ruined” by these changes. Yet. Nor is it clear which of these changes are because of Cortona’s newfound notoriety—and which ones would have happened anyway. But one thing’s for sure: If a place, whether Cortona or anywhere else, isn’t careful, it’s only a matter of time before residents will look around and realize they’ve lost the place they once knew and loved. Long before Cortona reaches that point, Marder’s hoping to help get its citizens to figure out a game plan for what they want their town to look like in the future. And that, Marder says, is part of why she and the crew chose Cortona: It’s at a crossroads. Right now, locals still can band together, decide what they want for their town, and take the preventative measures to make it happen. Or Cortona can continue to do what most places to do, developing without an overarching plan or desired outcome. Marder doesn’t say it, but in a worst-case scenario, lovely Cortona could wind up like, say, Venice, where, with 15 million tourists annually to 60,000 locals, the “touristification” process is already far along. Or like San Gimignano, even closer to home, which has only 7,000 residents for 3 million visitors each year—in a town whose historical center is so tiny, you can cross it on foot in less than 15 minutes. Marder and the crew have been working on this film for 2.5 years. (Without pay, by the way. More on that—and how you can help them get this film finished—in a bit). 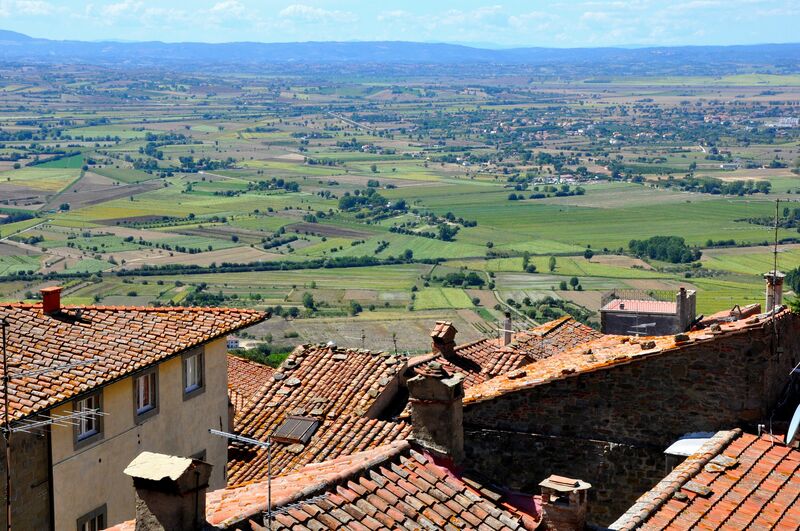 They know Cortona, and the issues facing any community in the modern world, particularly those under the magnifying glass of tourism, through and through. But ask Marder exactly what can be done to “save” Cortona while it’s at these crossroads, and she hesitates. “I don’t think there’s a magic bullet,” she says. “I see it more like being a parent.” (Marder happens to be a mother of four). “Needs change over time, but you just have to observe what’s going on, and figure out among your various options what’s the best way to deal with it.” She’s hoping to encourage people to see themselves as long-term stewards. Six-month initiatives sound nice, but, when it comes to protecting a place’s character, don’t do much. Sarah Marder and Max de Ponti gathering information in Cortona's main piazza. Photo: Antonio Carloni. And that’s something, she says, that the people of Cortona—and people in general—used to understand. “In the past, people were really rooted to their place,” she says. “They knew their livelihood and their survival depended on taking care of that little patch of the earth. Whereas now… we’re kind of all just running around.” Wasting water? Putting toxins in the soil? Using the earth’s resources as if they were boundless? No, no, not things you’d do if you knew you’d be living there for the rest of your life—and that nobody else, whether a mayor or a nonprofit, would solve the problem for you. In that sense, “we’ve been doing a lot of kooky things over the past 100 years,” Marder says. We’ve lost touch with how important our “place’s” well-being is to our own well-being… and yet, she says, we think that disconnect is normal. Can travelers do anything? Possibly. The “Genius” crew thinks tourism is part of the bigger sustainability picture—and we can each do our part to help. Visiting a place like Cortona in the off-season, rather than the high season, helps. So does seeking out local artisans and products, rather than off-the-rack labels and foreign-made souvenirs. Or not demanding services that aren’t part of Cortona’s fabric already—like wanting a villa with a swimming pool, even though Cortona is an arid place where water is precious. “For a place to be really well taken care of, it does need the collaboration of everybody. But I still think that the onus is mainly on the residents to figure it out and to guide the visitors in the way that they want them to behave,” Marder says. Here’s one thing that can be done: Help The Genius of a Place get made. And, in doing so, raise awareness. Start conversations. Spark thinking about what makes a place special—and what we can all do to preserve that character. This film, which (have we mentioned?) Marder and the crew have been working on for 2.5 years as volunteers (spending $20,000 of their own bucks along the way) just wrapped in August. But raw footage is one thing. A finished film is quite another. More than 4,000 minutes of film need to be cut down to… 90. Scores need to be made, sounds fixed, animated graphics made, rights paid. Some publicity wouldn’t hurt, either. Sure, Marder and the rest of the crew—Mattia Amadori, Andrea Corti, Max de Ponti and Andrea Aquino—could continue to work on the editing on the few odd days off between the production house’s paid jobs. The crew, and a particularly important writer, in Cortona. From left, Frances Mayes, Sarah Marder, Andrea Aquino, Max de Ponti and Mattia Amadori. (Photo: Ed Mayes). But at that rate, the film, which is being co-produced by Marder and OLO Creative Farm, would never get finished. And it’s their hope—and ours, too—that they can submit it to the Sundance Film Festival by the September 2012 deadline. So. Feel moved? Head over to The Genius of a Place‘s page at IndieGogo. Give $10; give $40; give more. (Each tier comes with its own specialized gift, like matted watercolor paintings of Tuscany or—our favorite—even hanging out with Sarah herself… and getting her to write a limerick for you!). And don’t worry: Here at Walks of Italy, we’ve contributed to this great cause, too. It’s a great way to give back to the country, and its places, that we love so much. Got any comments? Questions? Ideas? Share with us in the comments! Get Frances Mayes to contribute. She’s got a few euro. We know that she did contribute her time—she was one of the documentary’s interviewees. Beyond that, we don’t know if she was involved!